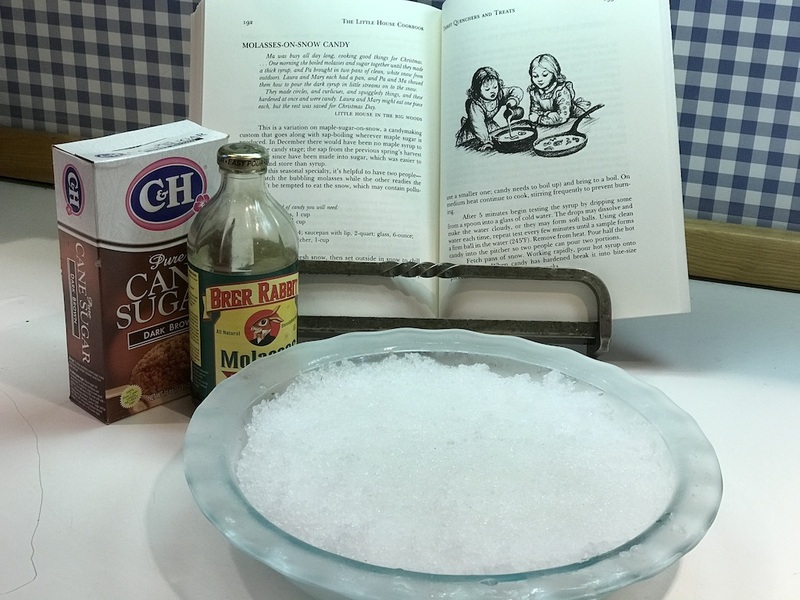 Ma was busy all day long, cooking good things for Christmas. . . . One morning she boiled molasses and sugar together until they made a thick syrup, and Pa brought in two pans of clean, white snow from outdoors. Laura and Mary each had a pan, and Pa and Ma showed them how to pour the dark syrup in little streams on the snow. They made circles, and curlicues, and squiggly things, and these hardened at once and were candy. Laura and Mary might eat one piece each, but the rest was saved for Christmas Day. Those of you who know us probably know that Kate is a wonderful reader who loves to read her favorite books aloud to me in the car on trips or at home in the evenings. 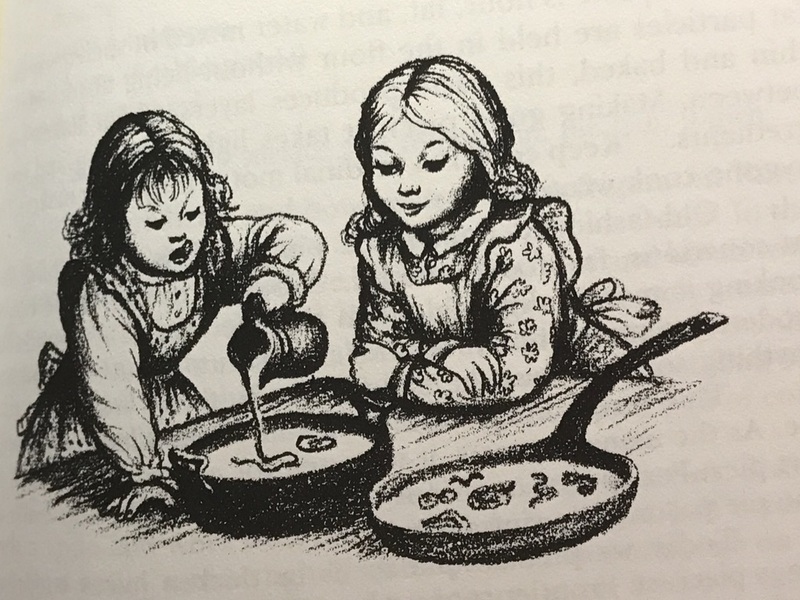 Knowing that the next cookbook on our agenda (book number 13) was The Little House Cookbook by Barbara M. Walker, Kate has been reading me Little House in the Big Woods, the first in the Little House series, which contains this irresistible description of homespun candy making. Having never read the Little House books, I had no idea that food memories played such an important role in Laura’s narrative. Barbara Walker’s delightful book collects those food references, places them in the context of the Little House books, and adds historical background and recipes. As much as I love historical recipes and cooking techniques, this book was right up my alley. 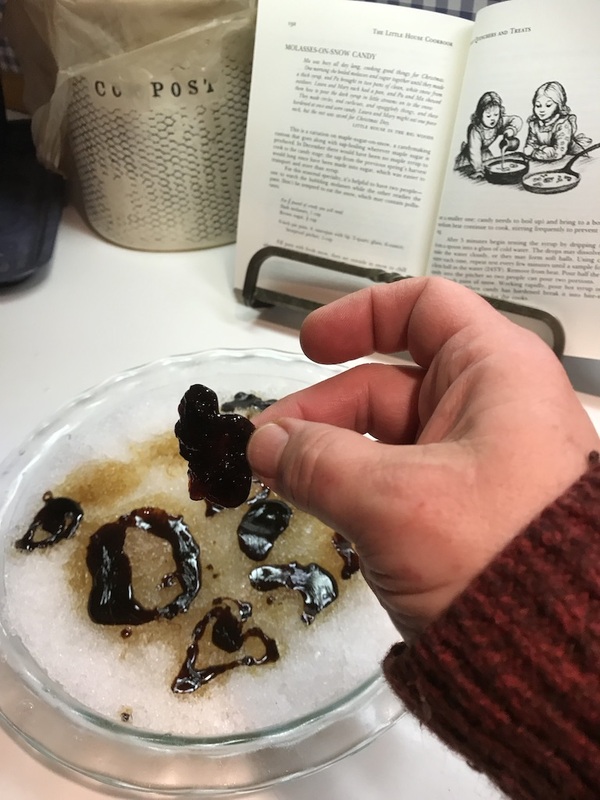 With relatively fresh snow on the ground, and molasses and brown sugar in the cupboard, what other recipe could we choose for a cold Sunday in January? I went outside to collect a pie plate full of snow from the dooryard and brought a small pot of molasses and brown sugar to a boil. 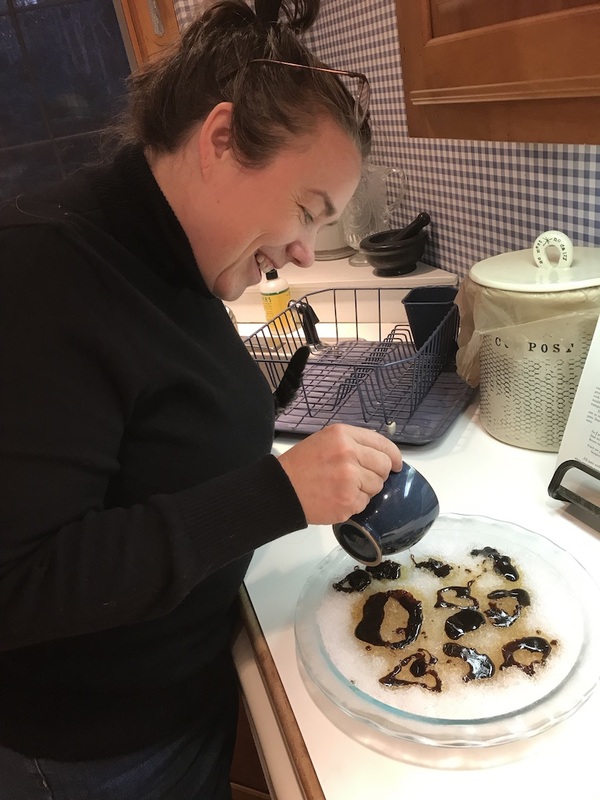 Once the syrup reached the firm ball stage (245° F), I poured it into a pitcher and Kate and I poured it out in designs on the the snow. Like Laura and Mary, we each ate one piece immediately. It was really tasty; chewy like caramel but with a distinct molasses flavor. We’re keen to try it again with boiled down maple syrup. Up next: Chez Panisse Café Cookbook (I know we said we were done with our Chez Panisse/Alice Waters cookbooks, but we found a used copy of this one at Powell’s and couldn’t resist). omg I remember this now!! !